Update: OK folks. You can start losing your Androids. Google turned the switch on for Android Device Manager on Aug. 7. After a simple activation process, our Android phone was locked down. 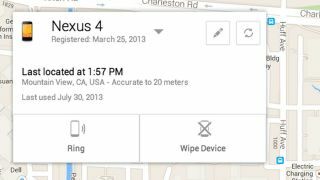 It appears to work for phones and tablets, and if you lose your device you can have Google ring it for five minutes, and Google Maps can pinpoint your phone's location. Should either of these methods fail in finding your phone, users can wipe their devices. To enable Erase Device, users will have to enable factory reset, achievable through the Google Settings app. It's an over-the-air update but you can also go to the Android Device Manager website to set up your devices. Absent-minded Android owners will be happy to hear that Google is finally creating an app that functions almost exactly like Apple's popular Find My iPhone application. Android Device Manager, set to release in the Google Play store this month, will help users track down, ring and wipe their Android-based smartphones and tablets. "If you ended up dropping your phone between those couch cushions, Android Device Manager lets you quickly ring your phone at maximum volume so you can find it," wrote Android Product Manager Benjamin Poiesz in an official blog post. Like the Find My iPhone app for iPhone, iPad and Mac computers, the Android version will ring even if the device is silenced, according to Poiesz. "And in the event that your phone or tablet is out of earshot (say, at that restaurant you left it at last night), you can locate it on a map in real time." In a worst case scenario, this Find My Android app allows users to wipe their smartphone and tablet data remotely from a browser or another device. "While losing your phone can be stressful, Android Device Manager can help you keep your data from ending up in the wrong hands," reassured Poiesz. "If your phone can't be recovered, or has been stolen, you can quickly and securely erase all of the data on your device." Android Device Manager is very similar to Find My iPhone, which is nothing but bad news for thieves on the prowl for expensive technology. However, Google's announcement today doesn't include information about remotely locking an Android device - an in-between step that could protect data while attempting to track down a potentially stolen device. Coming to grips with wiping an entire smartphone does take time. But Android Device Manager does have one perk - it'll use Google Maps to track down an Android smartphone or tablet, not iOS's still imperfect Apple Maps program. It will require signing into your Google account and Android 2.2 Froyo or above, which shouldn't be a problem considering a majority of Google device owners run Gingerbread or Jelly Bean and above. Read how the FBI may be tapping into Androids via your phone's mic.